Roast walnuts first. Preheat oven to 375F. Evenly spread walnuts in single layer on baking sheet and place in preheated oven for 8 minutes. Remove and roughly chop. Set aside to cool. Lower temperature of oven to 325F and line a baking sheet with parchment paper, set aside. Prepare the topping, mix together 6 Tablespoons sugar and 2 teaspoons ground cinnamon. Set aside. In a medium bowl, whisk together flour, cinnamon, baking powder, and salt. Set aside. In a large mixing bowl, beat together butter and sugar until light and fluffy (about 3 minutes.) Beat in egg, egg yolk, and vanilla. With mixer on low, mix in flour mixture. The dough may be slightly crumbly but this is expected. Turn dough out onto prepared baking sheet and shape dough into a log that is about 13 to 15 inches long and 3 to 4 inches wide. Brush top with lightly beaten egg and liberally sprinkle with about 3 tablespoons worth of topping (about half). Place in preheated oven and bake for 45 to 50 minutes, until lightly golden and firm to touch. Remove from oven and let rest until cool enough to handle. Keep oven at 325F. With a serrated knife (bread knife), gently slice log into ½ inch wide slices and place biscotti cut side down on baking sheet. 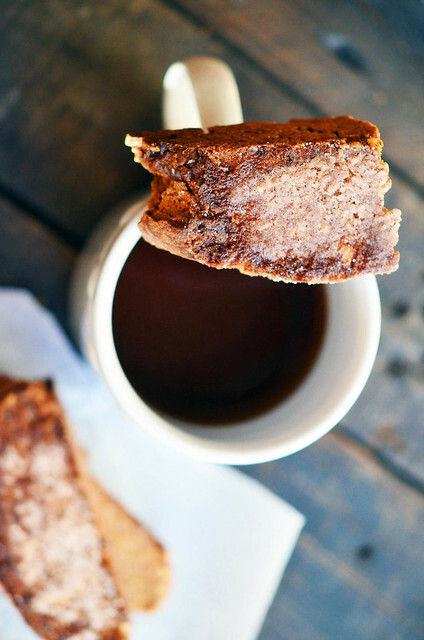 Sprinkle more cinnamon and sugar topping (about ¼ teaspoon) over each biscotti. Return biscotti to oven and bake for an additional 20 minutes until lightly golden. Remove from oven and let cool completely.